China accounted for 11% to 24% of the global increase in methane gas emissions between 2010 and 2015, according to a report published in Nature Communications on Tuesday. The study found China’s emissions of the polluting greenhouse gas increased 1.1 million tons each year over the period, suggesting efforts to control emissions from the world’s largest producer and consumer of coal have been fruitless. The report comes as anxiety grows about countries’ respective abilities to adequately cut emissions to prevent catastrophic effects of climate change that could occur as early as 2030. China has said that it is making efforts to wean itself off coal and is the world’s biggest investor in renewable energy — but in December, researchers anticipated that China’s carbon footprint will have swelled to a record size in 2018. Coal is the backbone of China’s energy sector and employs millions of workers. Reuters reported this month that more than $6.64 billion worth of new coal-mining projects were approved in 2018, a great deal more than in 2017. The study used six years of data collected by the Japanese space agency’s Greenhouse Gases Observing Satellite (GOSAT) — which measures changes in atmospheric methane and carbon dioxide over time — to explore the impact of environmental regulations and policies on methane emissions in China. Methane has many sources, but the researchers concluded that China’s emissions growth had come overwhelmingly from the process of coal production — from mining, processing, and storing the highly polluting fuel. In particular, the flammable gas is released from coal and surrounding rock during mining and must be ventilated out for safety reasons. If it is not captured during this process, it typically ends up in the atmosphere. “The first piece of evidence was that the biggest increases in methane emissions appeared to be occurring in areas with large coal operations,” Scot Miller, an atmospheric scientist at Johns Hopkins University and the lead author of the report, told Caixin. “Second, we saw that coal production increased between 2010-2015. Rice production and cattle farms” — other major sources of methane gas — “didn’t seem to have changed as much as coal production.” The study concluded that 33% of China’s man-made methane emissions are from coal. The growth comes in the face of apparent policy efforts to cut back on coal production and related emissions. Rules requiring the draining and disposal of methane in coal mines where methane content was more than 30% took full effect in 2010. When disposing of the gas, mines were instructed to burn it — converting it to carbon dioxide — or to use it for electricity or heating. But the rules seem to have had no impact on China’s methane emissions, the report found. 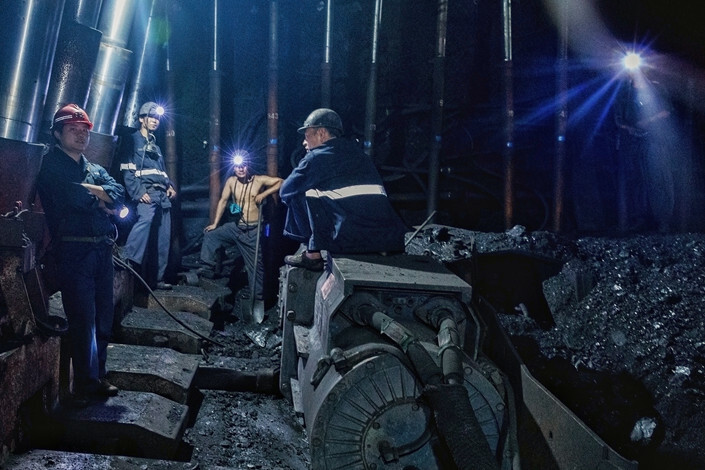 In China’s 13th Five-Year Plan (2016-20), it was said that the gas extraction capacity of coal mines is 13.6 billion cubic meters (480.3 billion cubic feet) — but the utilization rate was a mere 35.3%, creating what Miller calls a “lost resource.” As a primary component of natural gas, methane presents a cleaner energy source for heating and electricity. The report noted three major obstacles to reducing China’s methane emissions. One is a lack of technology and expertise suited to China’s mining conditions. A second is inadequate infrastructure for getting the gas from the mine to the market — many coal mines are located in mountainous regions, where it is hard to build pipelines. Finally, the U.S. Environmental Protection Agency has “anecdotal evidence” that many mines dilute drained gas to circumvent requirements, the study said.